There are many different types of a grapefruit diet menu plans. The original grapefruit diet plan was developed by American professor Kelly Brownell who specializes in obesity. Grapefruit diet plan is also often referred to as Hollywood weight loss diet which is probably one of the main reasons of why it is so popular. 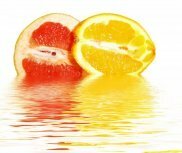 Another reason of grapefruit diet plan popularity is a fat burning grapefruit quality that it supposedly has. The authors of grapefruit diet menu claim that grapefruit possesses a miracle enzyme that splits up fats. To activate this amazing nutrient all you have to do is to eat at least half of fresh grapefruit with a little amount of any other food. The grapefruit diet plan that I have selected to display on my website is pretty strict. Even those who know a little about caloric food value can tell that the following grapefruit diet menu has less than 1500 calories per day. And for most of us 1500 balanced diet menu is enough to lose extra weight. But at the same time this is the best grapefruit diet that I have come across so far. Most other grapefruit diet menus can be classified as ‘fad diets’ and I generally do not advice them here. Those who have followed this grapefruit diet claim to lose up to 8 pounds in one week! I do not recommend you to set such strict goals but you can easily aim for about 3-4 pounds of weight loss in one week (or ideally 2 pounds.) In order to achieve that I suggest to add one extra snack for each day of this grapefruit diet menu containing 1 glass of milk and a piece of fruit. Breakfast – 1 grapefruit or juice from 1 grapefruit, couple of slices of am or cheese, 1 cup of coffee or tea. Lunch – 1 grapefruit, fresh vegetable salad, 1 cup of coffee or tea. Dinner – 4 oz of meat, chicken or fish, fresh vegetable salad, 1 cup of tea with honey. Breakfast – 1 grapefruit or juice from 1 grapefruit, 2 hard-boiled eggs, 1 cup of tea or coffee. Lunch – 1 grapefruit, 1 cup of cottage cheese, 1 slice of whole bran bread, tea or coffee. Snack – 1 granola cereal bar. Dinner – 7 oz of grilled or broiled fish, 1 cup of steamed vegetables, tea or coffee. Breakfast – 1 grapefruit or juice from 1 grapefruit, 1/2 cup of granola cereal with dry fruit, nuts and 3 tablespoons of yogurt. Lunch – 1 grapefruit, 1 bowl of any clear soup, 2 whole wheat toasts. Dinner – 7 oz of lean grilled chicken or turkey, vegetable salad, coffee or tea. Breakfast – 1 cup of fresh vegetable juice, 1 hard-boiled egg, coffee or tea. Lunch – 1 grapefruit, 1 large salad with 2 whole wheat toasts. Snack – 1 grapefruit, ½ cup of cottage cheese. Dinner – 1 plate of vegetable bean soup, 2 slices of cheese. Breakfast – Fruit salad including grapefruit. Lunch – 1 large baked potato with a little bit of olive oil, 1 large vegetable salad, 1 cup of tea. Snack – 1 grapefruit or juice from 1 grapefruit. Dinner – 7 oz of broiled meat, chicken or fish with steamed vegetables, 1 cup of yogurt. Choose any menu from the previous days. Do not stay on this grapefruit diet plan for longer than 7 days. Instead you may add a grapefruit to your regular menu. It will supply your with good amount of vitamins and keep you in shape.